I love roasted spatchcock, or some may call them poussin. They are so delicious (far better than a roasted chicken for me). 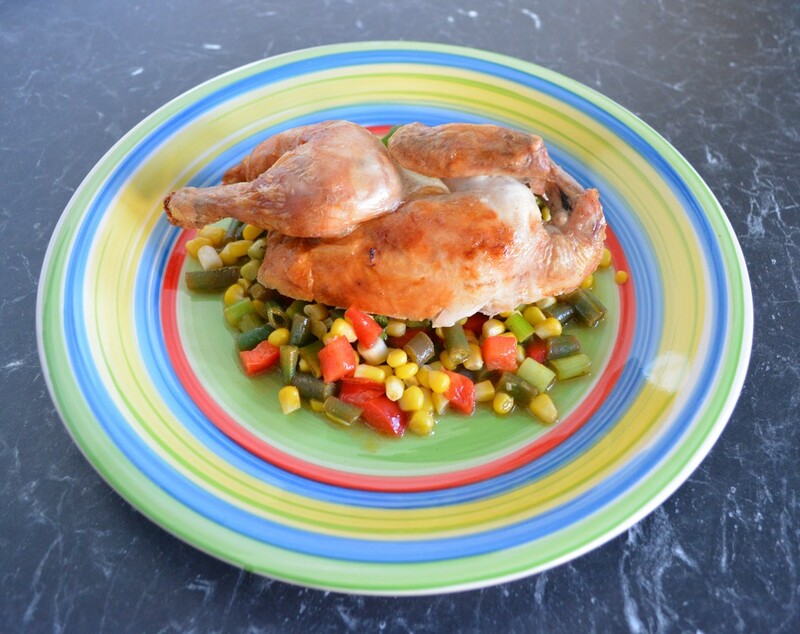 The meat is so tender, the breasts are so moist, not dry at all, and they are really easy to cook. It is Bill Granger week in my house, all new recipes must come from his cookbook Bills Food. Now I will say, Bill says to roast the spatchcock for 35 minutes, mine needed 50 minutes to be cooked through, where the meat fell off the bones and everything was still juicy, not dry, it will depend on the size of your spatchcock, I tend to buy around 600g spatchcocks. So you will need to keep an eye on the spatchcock a little, it is done when the skin is crisp and when you poke the chicken with a skewer, the liquid is clear, not pink. Do not overcrowd your roasting tin, make sure there is space between each spatchcock, that will ensure even cooking and crisp skin all over. This is perfect when cooking for one, as you can still enjoy a roast, but not have tonnes of leftovers. My family love the individual portions they get, they think it is great. And I love it, as when I roast a whole chicken, my kids take the legs, wings and thighs, and I'm usually left with the dry breast that no one wants. By roasting spatchcocks I get to have legs, wings and thighs to, and the breast is so delicious I enjoy that to. The Spicy Corn Salad I really enjoyed, it was crunchy and really tasty. If you prefer you could serve it with a simple green salad to accompany the spatchcock. Make whatever side you like, this is merely a suggestion. The recipe is ultimately about the spatchcock. 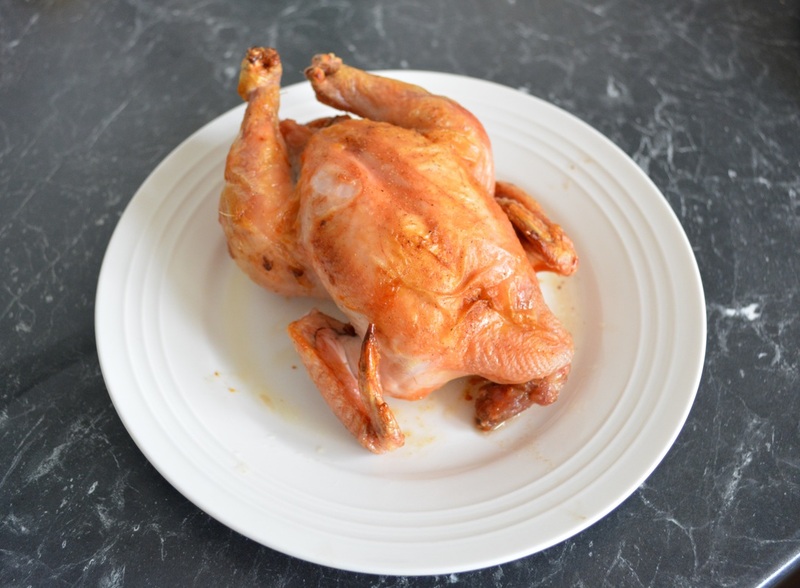 So here is a really simple roasted spatchcock recipe you should try, it really is worth it. Season the spatchcock liberally with salt and pepper inside and out. Thinly slice the lime and squeeze some of the lime juice over the skin of the spatchcock. 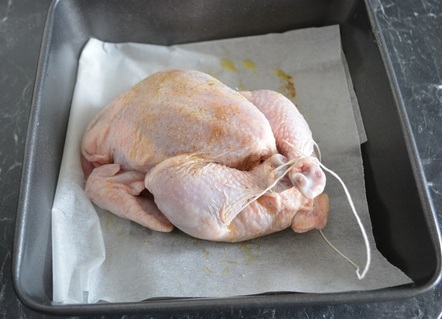 Put some lime slices (about 2 slices in each spatchcock) into the spatchcock cavity, then tie the legs together with kitchen string. Place the spatchcock with the breast side up in a roasting tin (make sure there is space between each spatchcock for even cooking) then drizzle with the olive oil. Bake for 50 minutes or until golden and cooked through. Start checking it after 40 minutes as each oven is different. 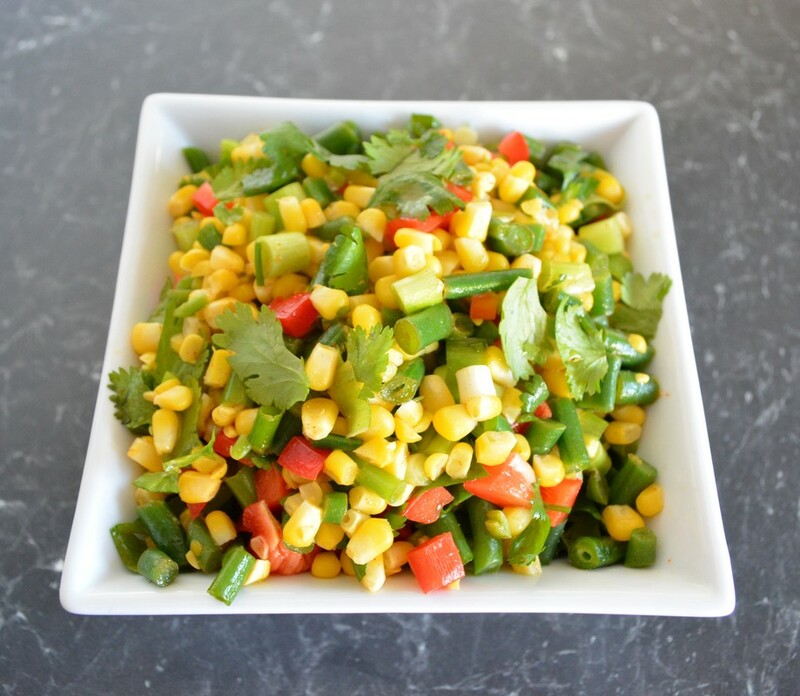 While your spatchcock is baking make the spicy corn salad. Bring a saucepan of water to the boil over a high heat, add the corn kernels and green beans. Once the water comes back to the boil, cook for one minute. Drain and refresh under running cold water. Whisk the olive oil, lime juice, chilli, sea salt, pepper, cayenne pepper and cumin together in a large bowl to combine. Add the corn, beans and remaining ingredients and stir to combine. Allow to rest for 20 minutes so the flavours can develop. Stir again. 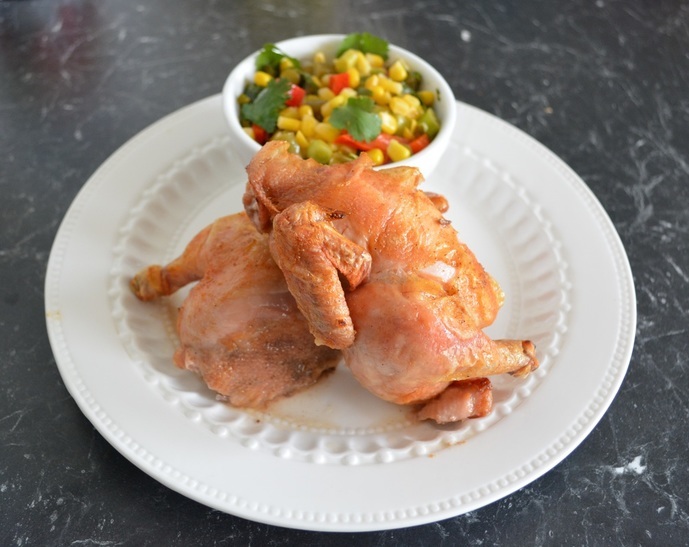 ​Serve the spatchcock with the spicy corn salad and a few fresh coriander leaves if you like.